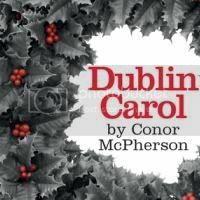 In contrast to the thematic sprawl of The Veil, Conor McPherson's Dublin Carol (revived here to showcase director Abbey Wright, in the penultimate Donmar Trafalgar production,) is short and to the point. John (Gary Lydon) is an undertaker, being assisted at a funeral on Christmas Eve by his boss' nephew, Mark (Rory Keenan, who's shaved his beard off to look younger, although trying to pass for 22 is a bit of a stretch.) John confronts his troubled past, first when he tells the younger man about how his hard-drinking lifestyle nearly landed him literally in the gutter until Mark's uncle helped him; and later when Mary, the daughter he hasn't seen for 10 years, returns. This latter confrontation reveals that John's redemption hasn't been as complete as he might have pretended. As riffs on A Christmas Carol go, this isn't one that comes with a neat resolution, and any self-knowledge that's achieved comes with provisos. It's an intense and dark 70 minutes but with occasional flashes of humour, and the cast all give strongly focused performances in the intimate space. The many mugs and cups that get frequently refilled with whisky get some rough treatment from the actors but one cracked mug did get its revenge tonight - at least, since it wasn't mentioned by the characters, I took it that the blood dribbling down Lydon's hand was real. Dublin Carol by Conor McPherson is booking until the 31st of December at Trafalgar Studio 2.